Note from Daily Trade Alert: We’re launching a new regular column here at Daily Trade Alert called High-Yield Trade of the Week. The goal of this column is to show our readers how to safely boost their income from some of the best stocks in the world. It’s our sincere hope that you benefit from this new service. This past weekend I traveled to San Salvador, El Salvador for my friend’s wedding. It was a great opportunity to get to learn a little bit about a country and culture I had never experienced before… an opportunity to meet up with some old friends… and an opportunity to make some new ones. One of the people I met at the wedding, James, was about my age (37) and told me about his interest in biotech stocks. He seemed like a very smart guy, and he was really enthusiastic about the explosive growth potential of some of the stocks he’s been researching. I had never heard of his favorite idea, one that he’s hoping will make him a lot of money in a relatively short period of time. In all honesty, when it came my turn to tell him what stocks I’m enthusiastic about, I think I let him down. That’s because I prefer boring, established companies that everyone has heard of. The companies I invest in — high-quality dividend growth stocks — won’t make you rich overnight… but they should make you rich over the long-term. [ad#Google Adsense 336×280-IA]You see, dividend growth investing is one of the best long-term strategies for those looking to build a stable, growing income stream that can fund your needs, desires, and retirement over time. There’s just one catch to this kind of investing: you need time. Case-in-point: a handful of today’s best dividend growers don’t offer much in the way of current income. Those with a long enough time horizon can take advantage of these stocks for their long-term dividend growth potential. That should more than make up for a low entry yield. But those who need high income today need a different strategy. And the one I’m encouraging you to consider is one I’ve been using in my own personal retirement portfolio. In short, what I’m talking about is selling a cash-secured put or a covered call on a high-quality dividend growth stock when it appears to be trading at a reasonable price (at or below fair value). When executed properly, this kind of trade can regularly pay 10%-plus annualized yields from some of the best companies in the world. I’m talking about earning double-digit annualized income from world class companies like Johnson & Johnson (JNJ), Coca-Cola (KO), Disney (DIS), Apple (AAPL), Starbucks (SBUX), Microsoft (MSFT) and many more. Still, many investors overlook these relatively safe, high-yield opportunities for one simple reason: they don’t understand how they work. But as I’ll show you in High-Yield Trade of the Week, these trades aren’t complicated at all. And because you collect immediate income, which lowers your cost basis, they’re actually safer than purchasing shares of the underlying stock outright. With all of this in mind, allow me to introduce you to this week’s High-Yield Trade of the Week — a trade with one of the highest-quality companies in the world, and one that could pay you 16.7% to 28.9% in annualized income. As an investment, Nike meets all my criteria: It’s a high-quality dividend growth stock that appears to be trading below fair value. Because of Nike’s fast-growing dividend and reasonable valuation, I think long-term investors could do well buying at today’s market price, holding for the long-term, and reinvesting dividends along the way. However, for those looking for high current income, forget it. Shares yield just 1.25%. You see, by selling a covered call on these very same shares, we can boost our income significantly — generating an annualized yield of 16.7% to 28.9%. That’s over 13x the income! 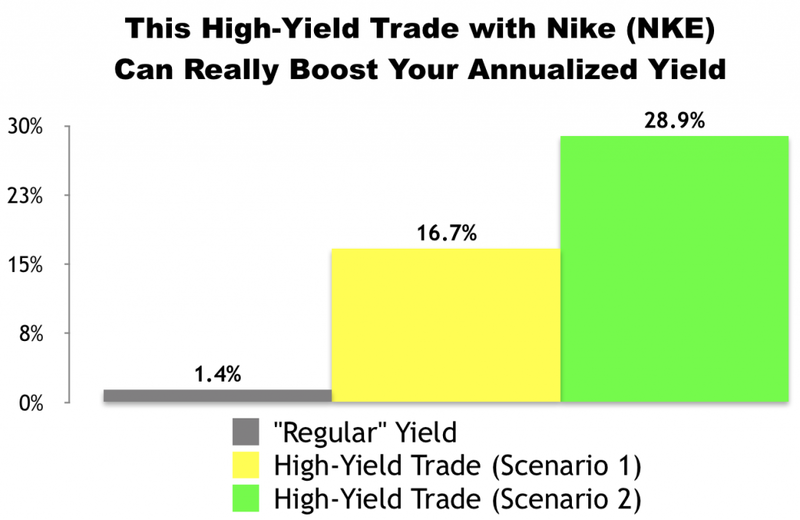 In fact, I just personally made a high-yield trade with NKE a few days ago and shared the details here. Because the stock is up today on a strong earnings report, I’ve asked my colleague, Phil Lamanna, to update the numbers for anyone watching this trade today. As we go to press, NKE is selling for $57.69 per share and the August 11 $58.50 calls are going for about $1.11 per share. Our trade would involve buying 100 shares of NKE and simultaneously selling one of those calls. By selling a call option, we would be giving the buyer of the option the right, but not the obligation, to purchase our 100 shares at $58.50 per share (the “strike” price) anytime before August 11 (the contract “expiration” date). In exchange for that opportunity, the buyer of the option would be paying us $1.11 per share (the “premium”). To be conservative, we don’t include any dividends in our calculations for either of the following scenarios. The annualized yields are generated from options premium and applicable capital gains alone. So any dividends collected are just “bonus” that will boost our overall annualized yields even further. If NKE stays under $58.50 by August 11 our options contract would expire and we’d get to keep our 100 shares. In the process, we’d receive $111 in premium ($1.11 x 100 shares). Excluding any commissions, if “Scenario 1″ plays out, we’d receive a 1.9% yield for selling the covered call ($1.11 / $57.69) in 42 days. That works out to an 16.7% annualized yield. If NKE climbs over $58.50 by August 11 our 100 shares will get sold (“called away”) at $58.50 per share. In “Scenario 2” — like “Scenario 1” — we’d collect an instant $111 in premium ($1.11 x 100 shares) when the trade opens. We’d also generate $81 in capital gains ($0.81 x 100) when the trade closes because we’d be buying 100 shares at $57.69 and selling them at $58.50. In this scenario, excluding any commissions, we’d be looking at a $192 profit. From a percentage standpoint, this scenario would deliver an instant 1.9% yield for selling the covered call ($1.11 / $57.69) and a 1.4% return from capital gains ($0.81/ $57.69). At the end of the day, we’d be looking at a 3.3% total return in 42 days, which works out to a 28.9% annualized yield from NKE. We’d place a “Buy-Write” options order with a Net Debit price of as close to $56.58 ($57.69 – $1.11) as we can get — the lower the better. Options contracts work in 100-share blocks, so we’d have to buy at least 100 shares of Nike Inc (NKE) for this trade. For every 100 shares we’d buy, we’d “Sell to Open” one options contract using a limit order. Accounting for the $111 in premium we’d collect, that would require a minimum investment of $5,658.